La Maree is a restaurant in Brussels that was recommended to us by a good Belgian friend. We were only in town for a few days and needed to get our fix of good North Sea Seafood. Many come here for the mussels, which Brenda and I ordered. Bailey, however, wanted fish that night. Looking around at what the other tables were having, it seemed that the sole Meunier was a favorite amongst the diners. Upon trying to order it for our daughter, the nice waitress advised us that they also have a flounder version, which she thought was equally as good (and a better value). We took her recommendation. 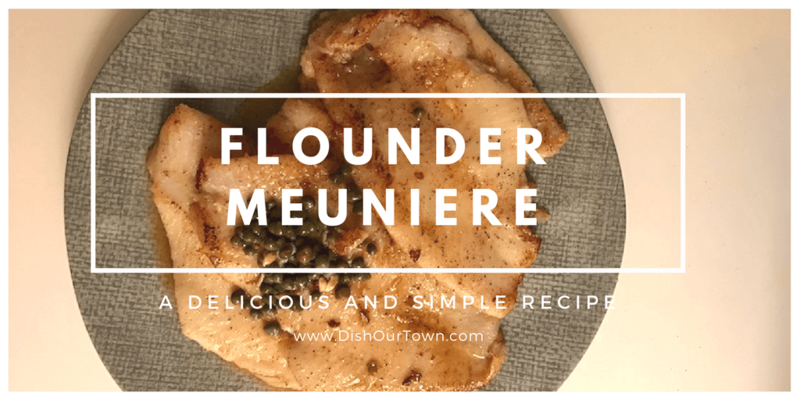 A few minutes later came out a nice big plate of flounder Meunier, seared to perfection and seasoned and dressed with balance. According to Bailey, It was the best plate of fish she’s ever had. This fish dish is easy on the pocket and even easier to make at home. Below is the Dish Our Town version of the recipe. A recipe to take you to Brussels during your meal. Tonight, make this dish and we can transport to Belgium. Take fillets and pat them dry with a paper towel. In a bowl, mix a half a teaspoon of salt and a quarter of a teaspoon of ground black pepper with a cup of flour. Then transfer mixture onto a flat surface or a plate. Lightly coat fillets on both sides. In a skillet, over low heat, melt half a stick of butter. Once butter is melted turn heat to medium and add fish. Do not crowd the skillet with too many fillets. Cook each side for 2-3 minutes. If all your fish does not fit in the first batch, just continue to use the butter that is in the pan to sear the remaining pieces. If butter runs low, just add a bit more. Remove fish and put in a nice large serving platter. The butter that remains in the pan should have somewhat browned (if it hasn’t, don’t worry). To this, add the juice of a whole lemon. 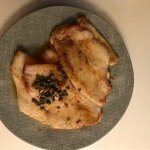 We like to use capers in this recipe (if you’d like to follow) add about a tablespoon into the pan. Bring to a slight sizzle and pour sauce over fish. Grate some lemon peel over the fish for presentation. If you prefer parsley (finely chopped) rather than capers, this is the time to add.
. It also seals in all the flavor. My favorite part is that I’m able to use it in any room of the house that has an outlet. Great for cooking tableside. Every time we make this dish, we remember the kind recommendation that was given us by the waitress, and the fun time and all the great food we had in Brussels. Some links are affiliate links but prices, as always, remain the same for you. PIN this recipe to your fish recipe board! It is very good, thank you. I feel so lucky finding your post, food looks so yummy! Thank you, Megan, for the kind words. Hope you check in with us often.